Clay, sometimes known as plasticine, is a putty-like modelling material made from calcium salts, petroleum jelly and aliphatic acids. Clay can be easily molded into different shapes and can be reused many times, making it ideal for creative works. Nowadays, clay is widely used for children's play, but also as a modeling medium for more formal structures. 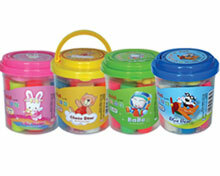 It is available in various colors to suit different requirements, such as red, yellow, green, blue, etc. As an experienced clay supplier in China, we have received the ISO9001:2000 and ISO14001:2004 certificates as a result of our dedication to quality and environment. In order to ensure our customers find the products they require, we provide a wide range of office supplies, including stapler, paper punch, binder clip, desktop set, pencil case, pen bag, clipboard, paper trimmer, and more. These products are reliable, eco-friendly, easy to use and economically priced. For more information regarding our stationery, please feel free to contact us. We are looking forward to working with you!